New Winter 2018: The hang gliding Santa glass Christmas ornament from Radko is a favorite with those who enjoy gliding above land and sea and with those that collect fun and unusual Santa ornaments for their display. This is a handcrafted glass Christmas ornament that is finely detailed in all its festive features, one of many glass Santa ornaments in the Radko collection. 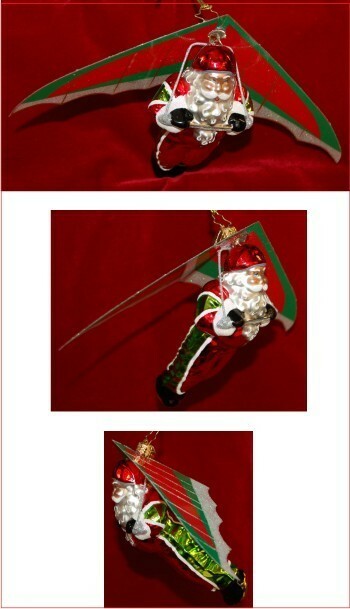 At nearly 8” wide, the Santa on a hang glider personalized Christmas ornament will make a colorful addition to your tree, and it looks fabulous on an ornament stand too. At your option, we’ll include a handsome Radko gift box with your order.